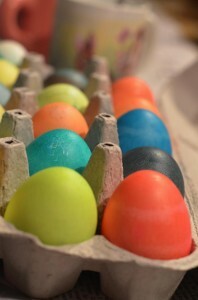 Coloring Easter eggs is always fun in our home. Nothing too elegant, just basic colors with natural dyes. No PAAS in our home! Yesterday, I was outside, wearing a short sleeved shirt while washing the car. It was simply lovely. Since my office is closed on Good Friday, I had the opportunity to go run a few miles wearing shorts and one long sleeved shirt. This morning is Easter and the sunrise was spectacular but we’re expecting rain later. Both kids are home all day, with my daughter heading back to school early in the morning. Even my mother in law will be here for Easter dinner and, later, a short stint with her taxes. For the record, I hate doing my own taxes. Why in the world would I ever volunteer to do hers? Just a sucker that is trying to be a good son in law I suppose. Federal taxes for both of us, Connecticut and Massachusetts taxes for us, then Connecticut and Georgia taxes for Connie. I’m not sure how I thought this was ever a good thing. Every year, there is at least one tax situation that I need to deal with that is both frustrating and scary to me. I’m sure I’ll be audited, although always error on the side of caution so it would be a simple mistake. This year, we sold several mutual funds in a standard investment account to pay off both cars. Since we are both investing heavily in our retirement plans at work, this seemed to be the prudent thing to do. We also have both kids in college so I need to determine what can come from those college expenses. It will be easier next year – at least that’s what I tell myself every year. Last night, we also celebrated our daughter’s 19th birthday. I’m not exactly sure when 19 years sped on by but she’s still my little girl in so many ways. Two weeks ago, I took her to the airport for her to fly to Tampa and join my wife at a conference (to work). When I said goodbye and watched her negotiate security and head to the gate, I realized that she has grown up into a lovely woman. She still has the eyes of a child in many ways, but has also been witness to so many adult things. She will be happy with life and know that we’ll always be a part of it which makes me a very happy dad! Happy Easter, happy spring, happy warm weather! This past weekend, Memorial Day in the US, ushered in Summer. This meant a three day weekend for most workers, including both of us. It was time to garden. So, we cleaned up the front beds, pulled dying plants, mulched, and installed a permanent edge strip around the beds to keep the grass on one side and the mulch on the other. We had some significant damage to a few of the plants, so cut them way back to encourage new growth.One of the things that really caught our eye after this winter is that several of the plants displayed the best flowers we have seen in our three years. We arrived after much of the flowering had completed (August), but the next two years were not overly amazing. This year, after the harshest year in decades, the flowers just popped. We’re enjoying every bit of it and doing our part to have the same sights in the front of the house next year!